Thai Yoga Bodywork is a clothes-on, one-on-one series of assisted yoga postures, along with applied pressure along the body’s energy (sen) lines. By balancing the body’s need for movement and stretching it can help the client reach an ideal combination of strength and flexibility, and improve overall physical and mental well being. Using knowledge and intuition, combined with precise balance and weight, the practitioner choreographs movements with energy, fluidity, balance, rhythm, breath and touch. This is an ancient and powerful healing therapy, originating over 2500 years ago, and is still a respected healing practice today. “My first experience with Thai Yoga Bodywork was a few months after the passing of my younger brother. My body ached from grief and I needed some relief. A friend suggested Thai Yoga Bodywork might help me feel better, and I went to my first 90-minute session. I experienced a variety of emotions and physical sensations: anxiety, because it was my first experience; a little pain, because my body was so tight; a few tears, as I felt a tremendous emotional release; and laughter, as I lay in the air on my back completely supported from underneath by my therapist’s knees and feet. It was an amazing experience and my friend was right, I felt a lot better! 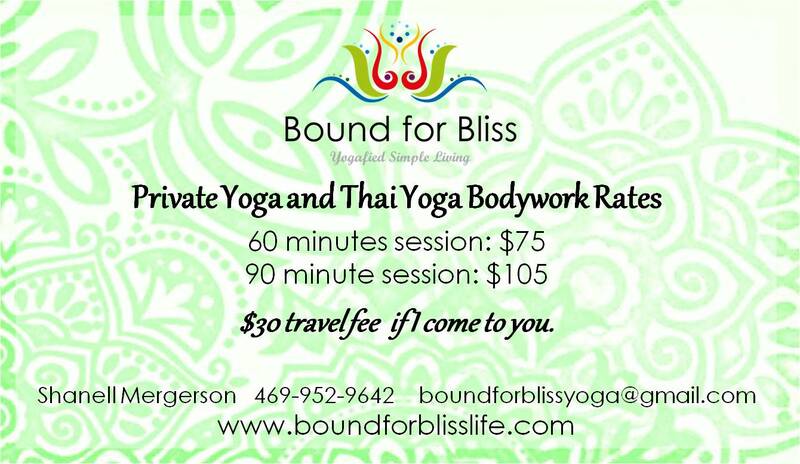 For more information, or to schedule a Thai Yoga Bodywork session, please contact Shanell at 469-952-9642 or email at boundforblissyoga@gmail.com.